Retours (à) was an installation articulated around 3 hanging screens positioned in a z shape. Three short pieces, 'Tan 31", "Motte" and "Berlu" were programmed to loop. 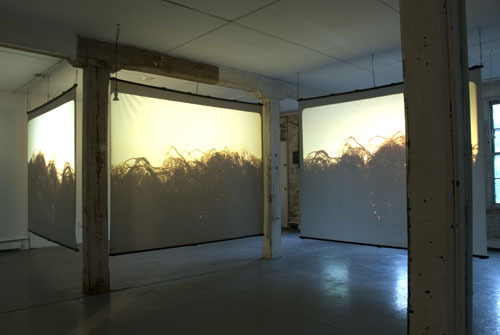 These three pieces use three elements: slides, lights and blank slides projected on screens, or only two of these. Each of the pieces is constructed on a different sound piece.